The Fire and Disaster Management Agency said Tuesday that 6,588 people were taken to hospitals nationwide to be treated for heatstroke in the week from Aug 1 to Aug 7. The figure was an increase of 2,525 over the previous week as a heatwave covered most of Japan, agency officials said. Twelve deaths were attributed to heatstroke, while 822 people had to be hospitalized due to their condition. Of the total number hospitalized, 3,330 were aged 65 and older. By prefecture, Osaka had the highest number with 416, followed by Tokyo (398), Aichi Prefecture (383) and Saitama (382). Health ministry officials continue to urge people, especially the elderly, to drink plenty of water and use the air conditioner when they sleep at night. On Tuesday, the temperature reached almost 40C, 104F, at Haneda Airport in Tokyo and 37.6 degrees in central Tokyo, making it the hottest day so far this year in the capital, the Japan Meteorological Agency said. 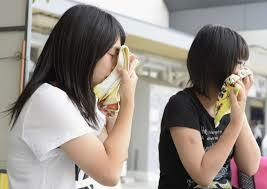 Nationwide, the highest temperature recorded Tuesday was 39.2 degrees in Kiriishi, Yamanashi Prefecture. Why blame just the Americans?